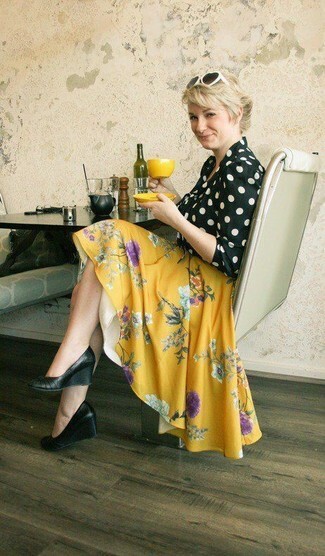 If you're hunting for a casual yet totally chic getup, pair a black and white polka dot long sleeve blouse with a yellow floral skater skirt. Both garments are totally comfy and will look fabulous paired together. When it comes to shoes, this outfit pairs perfectly with Pour La Victoire lozanne snake embossed wedge pump black. If you're on the lookout for a casual yet stylish outfit, wear a black blazer with mint skinny jeans. Both pieces are totally comfy and will look fabulous together. When it comes to footwear, this getup is complemented wonderfully with Pour La Victoire lozanne snake embossed wedge pump black. If you're on the hunt for a casual yet totally stylish getup, consider pairing a black leather biker jacket with black leather skinny jeans. Both pieces are totally comfy and will look fabulous together. When it comes to shoes, this ensemble is round off nicely with Pour La Victoire lozanne snake embossed wedge pump black. For an outfit that provides comfort and style, wear a red bodycon dress. When it comes to footwear, this outfit is complemented nicely with Pour La Victoire lozanne snake embossed wedge pump black. If you're hunting for a casual yet totally chic outfit, team a white and navy horizontal striped long sleeve t-shirt with black shorts. Both items are totally comfy and will look fabulous together. Balance this getup with black leather wedge pumps. If you're on the hunt for a casual yet totally stylish ensemble, reach for a black leather peplum top and a navy mini skirt. Both items are totally comfy and will look fabulous paired together. 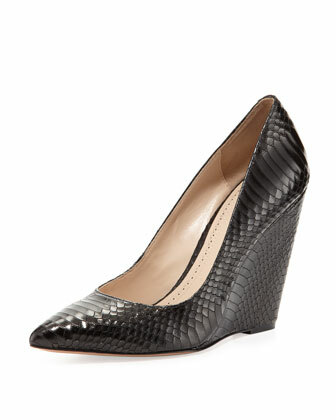 Pour La Victoire lozanne snake embossed wedge pump black work spectacularly well with this getup. If it's comfort and ease that you're seeking in an outfit, wear a white and black polka dot blazer and a white and black horizontal striped mini skirt. When it comes to shoes, this outfit pairs well with Pour La Victoire lozanne snake embossed wedge pump black. If you're searching for a casual yet chic outfit, marry a black quilted leather biker jacket with dark green camouflage skinny jeans. Both garments are totally comfy and will look fabulous paired together. Add a glam twist to your ensemble with Pour La Victoire lozanne snake embossed wedge pump black.